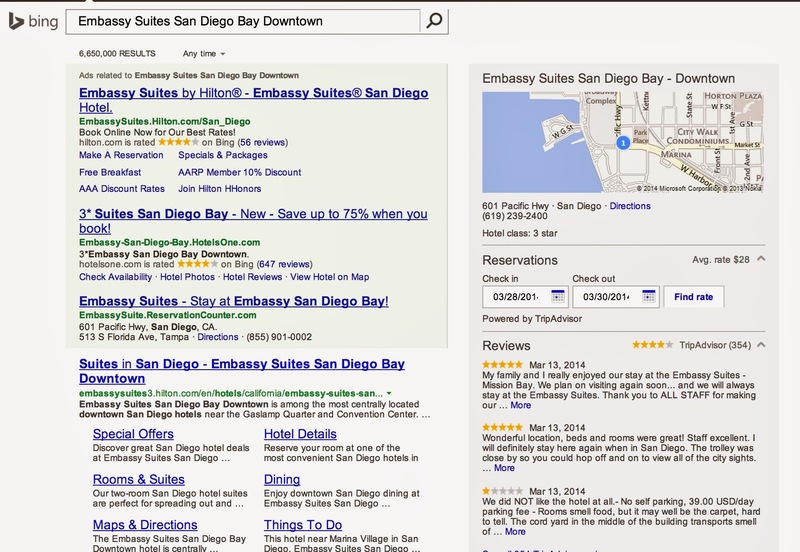 Yesterday I wrote about Bing's search for a hotel. Today, we turn to Google. They are not so very different from the consumer's perspective. The parts of the search screen are fundamentally the same, with slight nuances. Google recently changed their search in a couple of ways. First, their ads, which used to be shaded, now have an AD icon to make them stand out more. Each ad is preceded by the icon. I'll cover the other changes after we go through the main parts of the search page. When I do a search for the Mayflower Hotel, Seattle, I see 855,000 listings. By encasing the name in quotation marks, the list is cut in half. And remarkably, the number of ads are multiplied significantly and the photo/booking window on the right disappears, replaced by the right rail of ads. 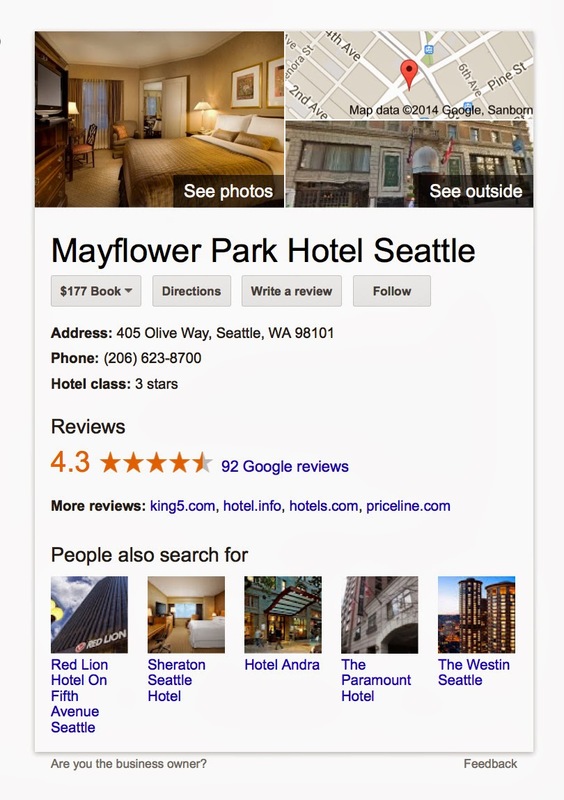 Here is a search for the Mayflower Park Hotel in Seattle. The only ad on the page (separate from the embedded ads in the booking window on the right that I'll touch on in a sec) is one from Orbitz. Orbitz appends the name of the hotel to the end of their URL, but as I mentioned yesterday, the name before the ".com" is still the name of who you are doing business with. Google offers advertisers a series of options on their ads, which includes embedding ratings, showing your Google+ number of followers and reminding the user of how many times they have visited that particular site. 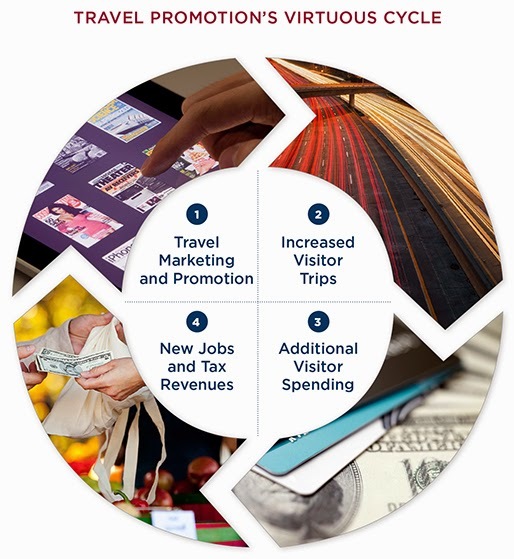 They can also include additional click ads at the end of the ad (4 Star Seattle Hotels and 3 Star Seattle Hotels are clickable links to Orbitz). 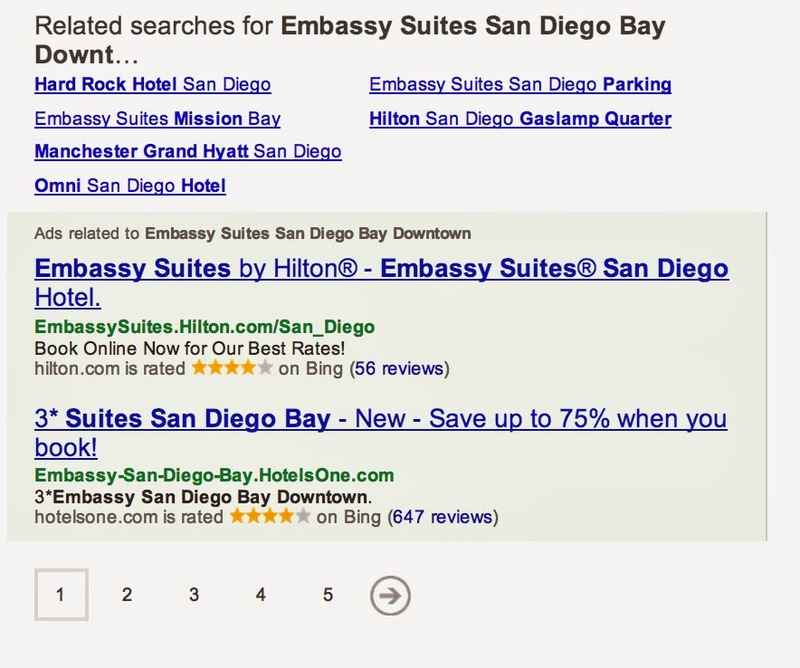 On Google, the next listing happens to be for the hotel itself. The hotel is taking advantage of several additional features on Google, including "sub-links" for Special Promotions, a Calendar, Contact Us, Our Hotel, Accommodations and Oliver's Lounge. There is also a link to display more results for mayflowerpark.com, so they can showcase other promotions using their same URL. The remaining listings on the coveted first page are those that directly relate to the original search. As you move back through the subsequent pages, the listings become less and less relevant. This feature is geared for the consumer that wants to search across different distributors of this hotel's inventory. This is known as meta-search, made famous by Sidestep and Kayak. If you fill in your check in and check out dates, you will see ads from Orbitz, Priceline, Hotels.com and getaroom ranging from $177 per night to $209 (not including tax and fees) and $206-$241 including taxes and fees. You can also click through to the owner's site (if the property has been claimed through the link at the bottom of the window). The same room is sold for $209 on the Mayflower hotel's site, shown as the "Best Available Rate". NOTE: As you can see above, Best Available Rate does not mean the lowest rate. It typically means the lowest unrestricted (read can be cancelled without penalty) rate. 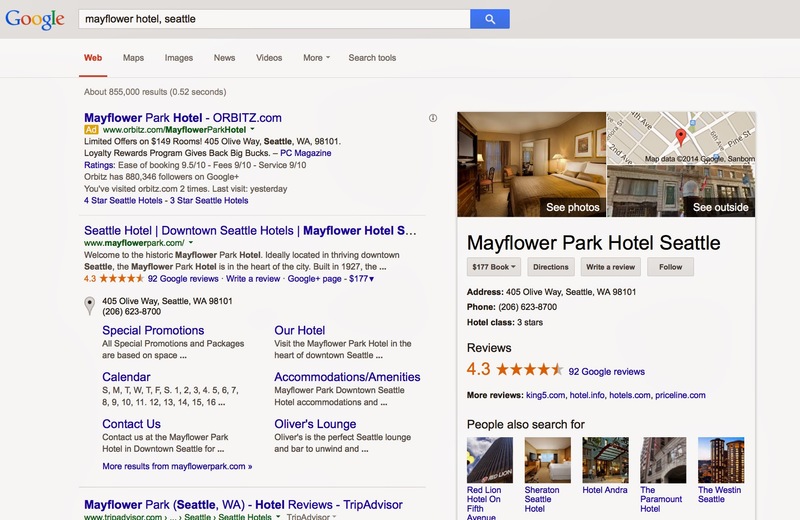 As opposed to showcasing TripAdvisor reviews, Google highlights its own rankings and reviews. They also prompt the user to write their own review, directly from the window here. The window also shows you other hotels that people are searching for in the Seattle area. 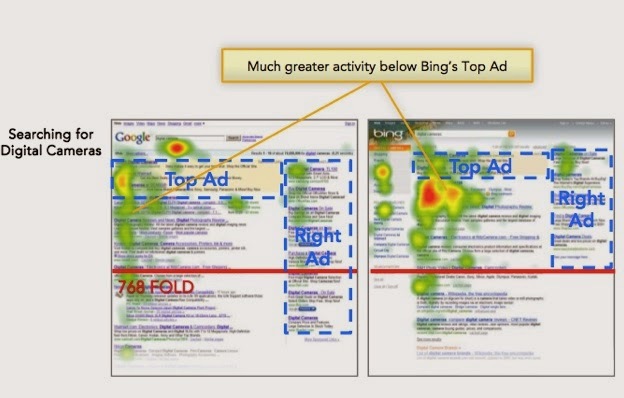 The real difference between Bing and Google is when you do a broader search. 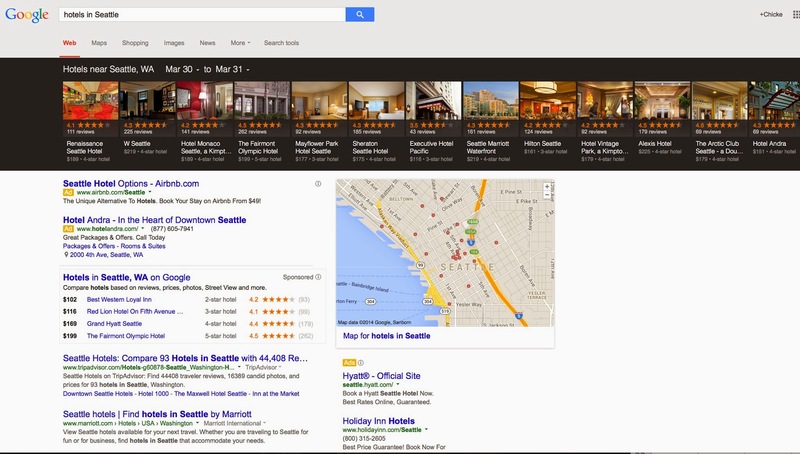 With Google, you get their "black banner", with a horizontal view of the hotels in the area. 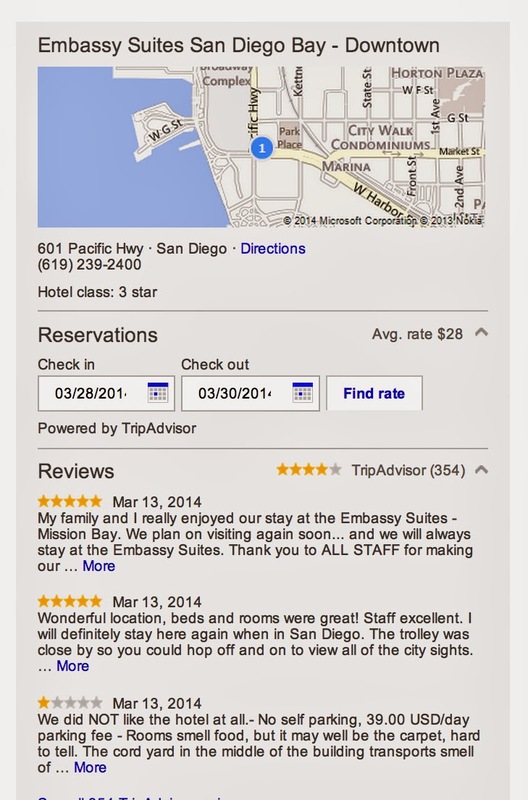 The listing scrolls and can be filtered by hotel class and rating. Beneath the banner are traditional ads, a sponsored (read: paid) listing of hotels, along with their average price, rating and reviews, organic search results, a map and then plenty more paid ads on the right side, with the Ads icon. A total of 14 ads on the first page alone, if you don't count the black banner properties, which no doubt subscribe to this type of display of their property. So what's a consumer to do? Enjoy the choice. Find the retailer that best suits you. If you know what you want, then clicking on the hotel's own ad is likely a good idea. If you are not so sure and don't have the time to browse through pages and pages of content, then a site that has a best price guarantee is your best bet. As I mentioned in my Tommy Bahama post yesterday, do pay attention to cancellation policies and fees. Don't assume that the hotel doesn't have non-refundable rooms. Remember the "Advance Purchase" rate is a euphemism for Non-Refundable. Travel often. Spend money. It is what keeps our economy going. Imagine walking down the street after a wonderful lunch with friends in a new neighborhood. A beautiful Tommy Bahama bedspread in the window grabs your attention. Your day is now complete. You walk in and see lots of other Tommy Bahama merchandise. In the back of your mind you wonder how you missed a new Tommy Bahama store opening so close to your home. You check out the price on the bedspread and you buy it, knowing it would be perfect in your bedroom and knowing that you've seen it for at least $200 more elsewhere. And it is the last one in stock! You feel great. In fact, you like it so much that you buy the bedspread, the pillow shams and a few accessory pillows as well. A few weeks later, you get your credit card bill and you see a $360 charge from Boscovs and you swear that you have never ever been to a store by that name. Muttering to yourself about credit card fraud which you've heard so much about on the news, you call your credit card company to dispute the charge. Then you post on social media about this company called Boscovs that had somehow gotten your credit card number and done an unauthorized charge. The next day you are driving in the neighborhood where you met your friend for lunch and there it is big as day. Oops..... You call the credit card company and have them reinstate the charge. But you forget to do anything about your social media entry. Ah, social media doesn't matter anyway. Then a few days later, you get an email from TommyBahama.com and there it is. That same bedspread for $100 less than you paid! It is on clearance. You are upset, so you drive back to the store and sure enough, as you are waiting to see the store manager you see it, right at the cash register. No cash refunds. Exchange for store credit only. You sheepishly walk out the door, feeling silly that you were so enamored with the bedspread that you didn't see the sign. Actually you never imagined that you would want to return the bedspread that you love. When you get home, still a little peeved, you pull out your receipt and you see it in large print at the bottom. NO REFUNDS. EXCHANGES FOR STORE CREDIT ONLY. It doesn't really make you feel better, only foolish. I tell this story, because it plays out online every day. Someone does a search on Google or Bing and are outraged after clicking on a listing and buying a product or service that they were not on the manufacturer/brand site. Some even go so far as swearing that someone "hijacked" their search. Here is a clue. If you are on the brand site, the URL will have their name prior to the ".com". And you will see their logo once you click on their link. Third parties are not generally allowed to use any logo other than their own. And as the story above illustrates, if there is any reason that you may need to return or cancel a product or service (such as changing your travel plans and needing to cancel an airline ticket or a hotel room), you need to read the policy regarding returns and cancellations. No matter whether there is a sign posted by a cash register or a notice on the checkout page or in the policy page of an online product, more often than not, customers often don't read it. 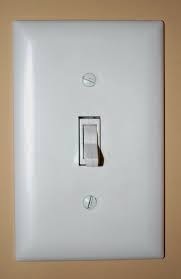 We are all desensitized and hit the Agree button on terms for everything from downloading applications on our computers and phones to buying books, electronics and travel online. Consumers see the product that they are looking for and do not pay attention to who they are buying from. They see the price and even a notice that there is only one left at this price and they buy. Most of the time it works out. But, when they see a lower price elsewhere or less restrictive terms on the brand site, they get upset that they didn't get that deal. Or worse, their plans change and they need to return the product or cancel the service, only to find out that they agreed to a restrictive set of terms. The moral of this story is that whether shopping in a new neighborhood or online, you need to know who you are buying from and on what terms. Don't say yes if you don't know who you are dealing with or whether you can change your mind tomorrow, next week or next month. Stay tuned. Tomorrow we'll look at how confusion occurs with consumers when they do a search on Google.